Michigan gets the win in East Lansing. So the day that millions of college football fans in the state of Michigan had circled on their calendars (or in some cases probably notched at the base of their backyard screaming tree) was finally here. All the stats had been combed over. All the insulting tweets sent. All the divisive Facebook postings, posted. Now it was time for the game to be played. Now it was time to learn where both teams stood in this rivalry. So what did we learn? We learned that this is, and always has been, one of the strangest games in all of college football. We tell ourselves every year that we know what outcome is in store, and every year the football gods remind us that we are mere mortals. Michigan State started the game with the ball and came out guns a blazin'. Running all sorts of misdirection with LJ Scott, and pretty much out muscled Michigan's front seven with a 12 play 75 yard touchdown drive. 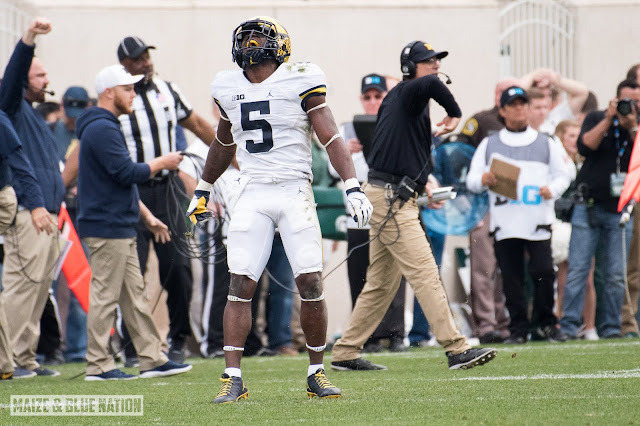 Michigan answered in equally impressive fashion on their first drive of the game with an attack balanced, 8 play, 80 yard drive that ended in a 3 yard Jabrill Peppers touchdown run. The second quarter was all Michigan. The defensive play was smothering, and the offense put 20 points on the board. And with a Jourdan Lewis pick shortly before the half that lead to a 23 yard Kenny Allen field goal, momentum was 100% with the Michigan sideline. Michigan came out looking confident in the third quarter, they got the ball to start the half and were driving down field, with Wilton Speight throwing darts to well covered receivers for big plays. 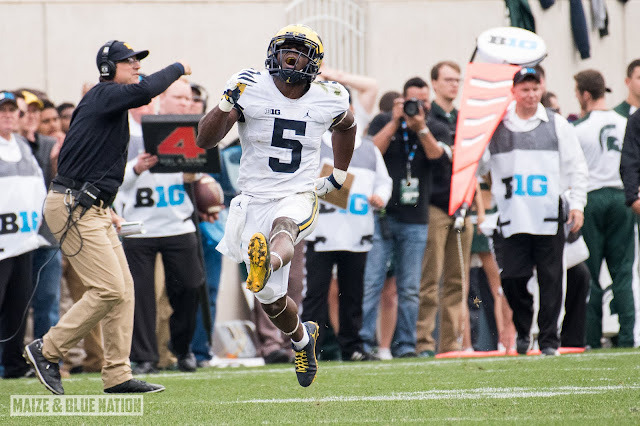 All indications pointed to the Wolverines finishing another convincing drive to go up 31-10, but a rare, poorly thrown ball by Speight resulted in an INT and killed the promising drive. It looked as though MSU's window to crawl back into this game had been opened, but that window was soon slammed shut by the Michigan defense, who stood tall on four plays with goal to go; leaving the Spartans with zero points to show for their efforts. The rest of the third quarter was a bit of a defensive stale mate, but one thing that was confusing to me was the lack of imagination in the play calling on the part of the Michigan offense in the second half. In the first half, you saw a lot of Peppers in the wildcat, you saw McDoom pick up 53 yards on 2 carries. In the second half: Peppers was used not nearly as much on offense and McDoom had zero carries. Over all, a far more conservative approach. On offense I thought there were many standouts. The entire offensive line had a really solid performance. The tight end play was really strong as well. 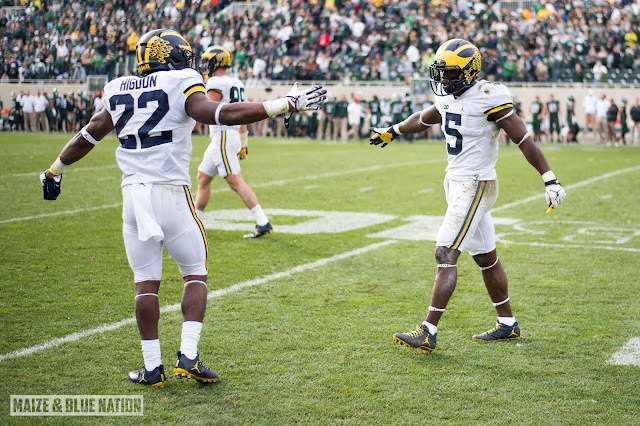 But for me, the players of the game on that side of the ball were Wilton Speight and Amara Darboh. Speight picked up right where he left off last week against Illinois, going 16 for 25, for 244 yards. A large number of those yards (165 to be exact) went to Darboh, who was just on another level today. When Coach Harbaugh was asked about Darboh's play, he simply said, "His game is at a very high level. Some of the highest I've seen from a college reciever. I think he's well established as a great playmaker." All in all, not the prettiest thing you'll ever see on a gridiron, but there were some real pluses to come away with. The kicking game that had been in question leading up to this game was, I think, resolved for the most part. When Harbaugh was asked about the play of Allen, he calmly stated, "He was flawless." 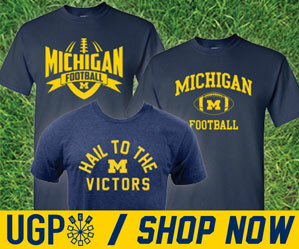 Could you say the same for many of the other facets of Michigan's game on Saturday? Not really. But when you're riding home with Paul Bunyan next to you, and you're 8-0 on the season, not too many teams have it better... Maybe nobody.